This recipe combines farm share arugula with artichoke hearts and loads of cheese in a baked vegetable appetizer. I've been sharing a lot of game day appropriate appetizers lately since it's 'tis the season and all, but I've been feeling a bit . . . well, guilty . . . since I've been using a fair amount of meat in them. I'm glad to share a meat free [and vegetarian if you select a vegan Worcestershire sauce] hot appetizer to join in the line up. This is a tasty way to eat up arugula from the Community Supported Agriculture (CSA) farm share, your garden, your folks' community garden plot, or the farmer's market. Usually when we get a big bag of arugula we're also getting a bag of salad mix, a cabbage, bok choy and perhaps another leafy green. I've talked about Greens Paralysis before, and it really comes down to this: if I can use arugula as a recipe component, not as a loose leafy green, I am more likely to use it up. If I wait for the perfect opportunity to add a handful of fresh arugula to a recipe . . . I end up tossing slimy forgotten leaves into the compost bin. One easy way to get arugula processed into something yummy is Arugula Asiago Pesto (recipe here--scroll down to the bottom). This freezes well and I use it like I use basil pesto (large volume 'empty the garden before frost' recipe here), though not the same as I use Fresh Tomato Pesto (recipe here). I came up with this appetizer because I had a late season bag of arugula and a desire for a hot appetizer. Using my food processor to combine everything made quick work of the vegetable preparation, and this was a warm and cheesy way to enjoy an early evening adult beverage. I haven't tried it, but warming this dip in a little slow cooker should work fine, similar to my Slow Cooker Salmon Artichoke Dip. I'm just happy to turn the oven on while there is frost inside my window! For other recipes using arugula, please see my Arugula Recipes Collection, part of my Visual Recipe Index. For other Awesome Veggie Apps and Snacks, please see my Pinterest board of the same name (linked). Yes, there is vastly more than the 1 cup cheese called for in the recipe. 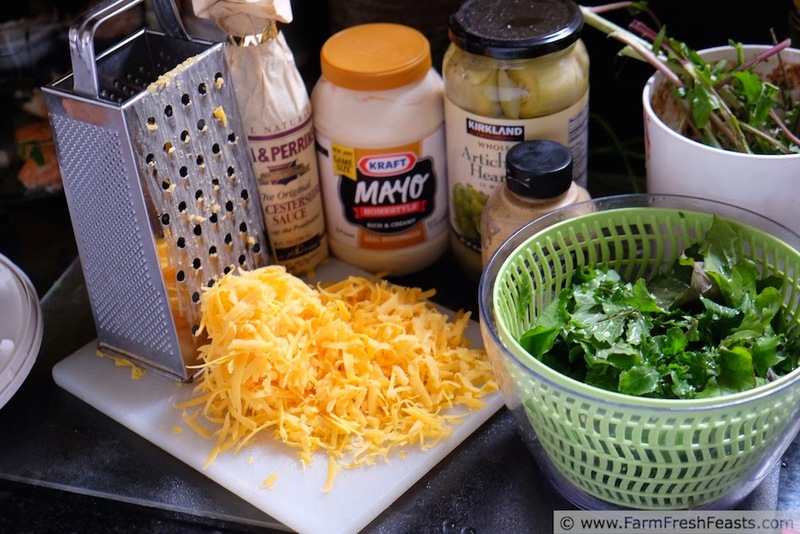 In my house, people passing by freshly grated cheese seem to think they can help themselves with abandon, so I always grate much more than I need. Ready to bake. Love me some Polish pottery. Preheat oven to 375 degrees Fahrenheit. Place arugula in a food processor and pulse to chop. Add artichoke hearts and pulse to combine. Add the rest of the ingredients and process until it is as smooth as you like, stopping to scrape down the sides once or twice. Transfer to an oven safe shallow dish and bake for 25 to 30 minutes or until top is browned and edges are bubbly. 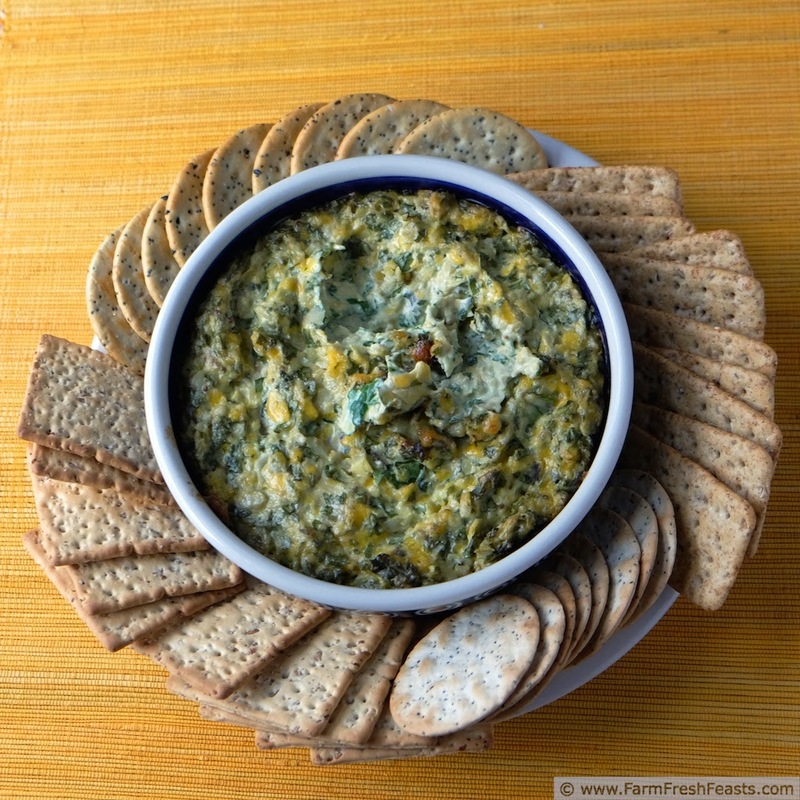 Serve with crackers, chips, or vegetable dippers. I <3 me my Polish Pottery! I'll be making this more when we get arugula in the early weeks of the farm share. Too good not to! I think I'm supposed to start spelling out the name of the state at this point, though it seems silly to me. I mean, what do the folks in Connecticut do? That's a tricky one to spell, and awfully long as well. Either way, from a current, albeit probably temporary Ohioan, woot woot! My kids do that too--try to steal shredded cheese. I don't know what it is about cheese shreds, but they seem to have a magnetic power! I love arugula, but I confess have never cooked it in any way. 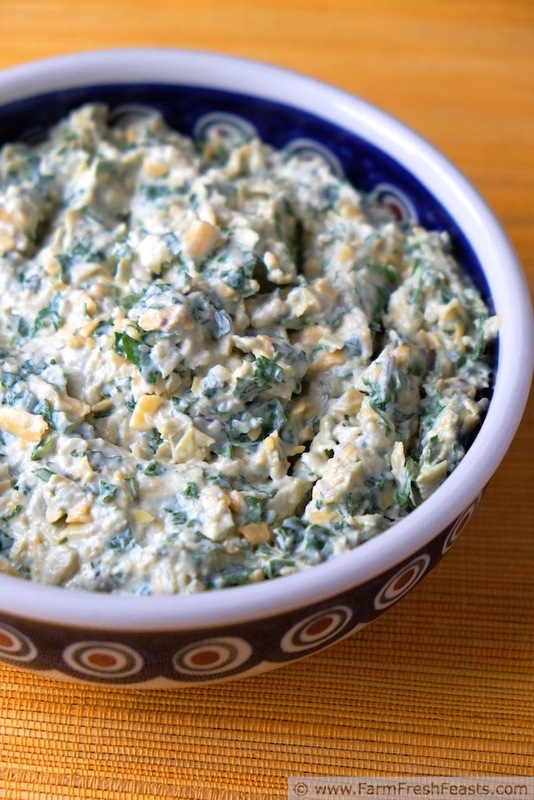 Spinach artichoke dip is the only way I will eat artichokes at all, so color me intrigued by this! Your house must be dip heaven this month! If I had my druthers (what ARE druthers?) my house would be dip heaven every month. Dips are the best. For Valentine's day we're dipping baked heart shaped red and white cheese-filled ravioli (Costco) and baked mozzarella sticks into a tomato sauce that I will make as soon as the bag of slow roasted tomatoes has thawed. I love offering a veggie dip option, and this sounds like a delicious one! My house is filled with omnivores but I still like a variety in our dips. It's the spice of life, after all! I am a huge arugula fan and am always trying to come up with new and different ways to use it - so this recipe really has me excited! Can't wait to try it! 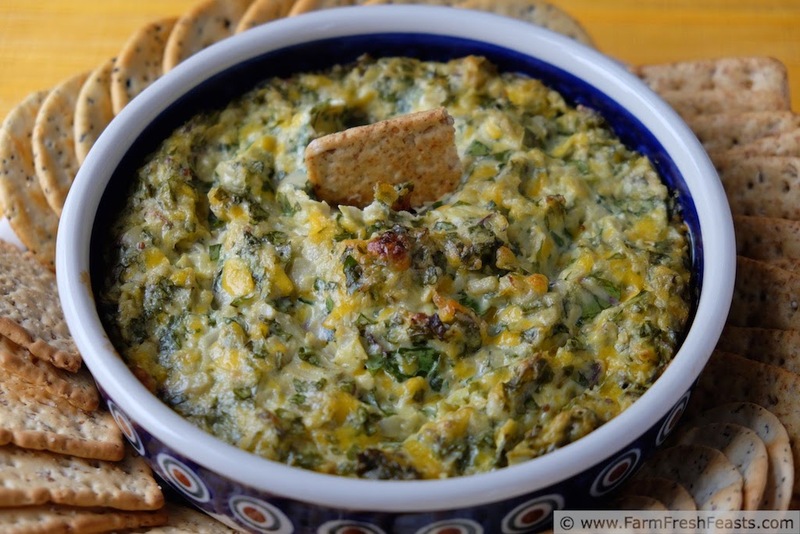 If I, as someone who tolerates arugula (but I'm a fan of chard and spinach), can enjoy it in this dip, then an actual fan would probably be in heaven. I am so excited to find this recipe! I also suffer from greens paralysis. :-) What a great way to use up some arugula. I am so glad to know I'm not alone in my Greens Paralysis! We've got a great Tribe. Currently, only my spouse and I like artichokes as stand alone items. As with Indian food, I expect that will change. Even so, I keep those tall Costco jars of artichoke hearts in the back of the lowest shelf of the fridge so they are not as easy to spot. I'm slightly sneaky that way. My kids also know to ask 'do you need this for the blog?' before wiping out anything. Bless them. I love anything with arugula! This looks nice and simple but delicious. I need to make more time for appetizers in my life. Appetizers are just fun for me--I probably spend way too much time thinking about them and plotting my Super Bowl App Strategy. I have a friend who always brings artichoke dip whenever we have an event. Maybe this time, I'll do the appetizer and surprise her with this interesting twist. 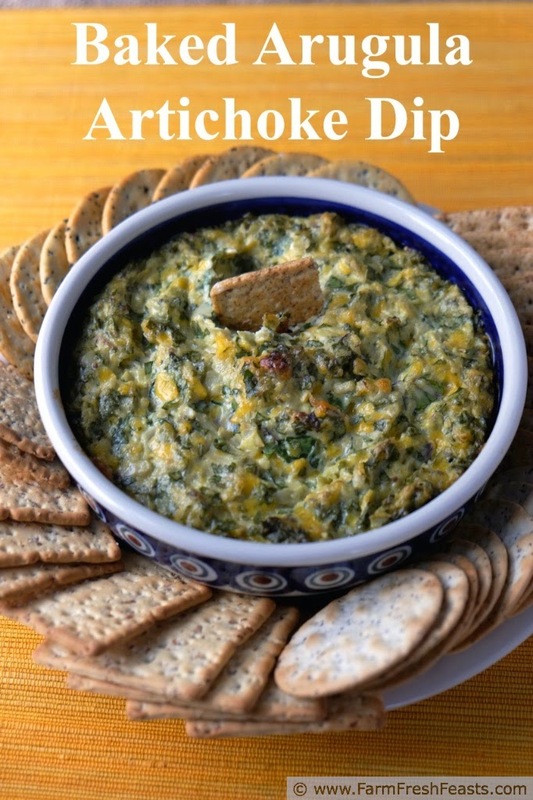 I thought artichoke dip was the Bomb, until my friend made Salmon & Artichoke Dip for an event. Then plain artichoke dip never did it for me again--I love those flakes of salmon. However, I also like variety for a bunch of different eating styles, so this works for me too.If it wouldn't offend your friend--go for it!